Christian Fellowship’s Lady Eagles finished out the regular season with a hard-fought 3-2 loss to Calloway County Tuesday. Calloway County won the first two sets, 25-16 and 25-12 with the second two going to the Lady Eagles, 25-10 and 25-23. The Lady Lakers won the fifth and deciding set by just two points, 15-12. Abigail Cima sending the ball to the setter in Christian Fellowship’s five set loss to Calloway County. Leading the way at the net in kills for CFS was Abigail Cima with 18, Maggie Wagner had seven, Lexi Hovekamp four and Emma Fletcher three. Fletcher led in aces with four with two each by Hovekamp and Brecksyn Etheridge. Etheridge led in assists with two and two blocks each were recorded by Cima, Hovekamp and Kenzie Murdock. CFS finishes the regular season with a record of 16-9. 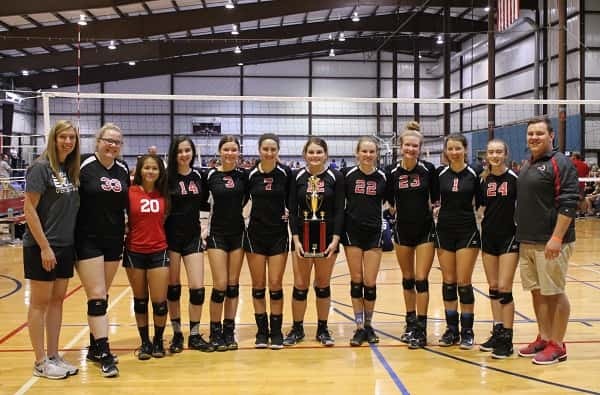 Over the weekend, the Lady Eagles played six games in the McCracken Quad State Tournament at the Plex in Paducah and came away with runner-up in the Silver bracket. After losing to Hopkins Central 2-1 and Hazel Green 2-0, CFS beat Warren East 2-0 and was placed in the Silver bracket. CFS beat White Station 2-0 and Breckinridge County 2-1 which sent them to the championship game against Logan County where they fell 2-0.